I had a wonderful trip to Brugge/Bruges to attend the foodpairing seminar The Flemish Primitives. I got to meet many interesting people including Heston Blumenthal, Peter Barham, Andrew Dornenburg, Karen Page, Ben Roche and Tony Conigliaro to mention a few. I also finally had the opportunity to talk to my fellow Swedish food bloggers Lisa Fí¶rare Winbladh (Matí¤lskaren, Swedish only but Google can translate) and Malin Sandstrí¶m (Matmolekyler, Swedish only but Google can translate) who’ve recently been awarded money to write a Swedish book about molecular gastronomy for home cooks. I even talked to several people who read Khymos! It’s always nice when I can attach some faces to the crowd out there in the big, unpersonal blogosphere. As you see from this long post the day was packed and believe it or not – there will be a couple more posts in the next few days. One on the surprise “chocolate box” (for me this was the highlight), a summary of the interview with Heston Blumenthal and some info on the chemistry behind the glowing lollipops! I’ll also try do dig up the recipe for the chocolate dip that came with our lunch fries. 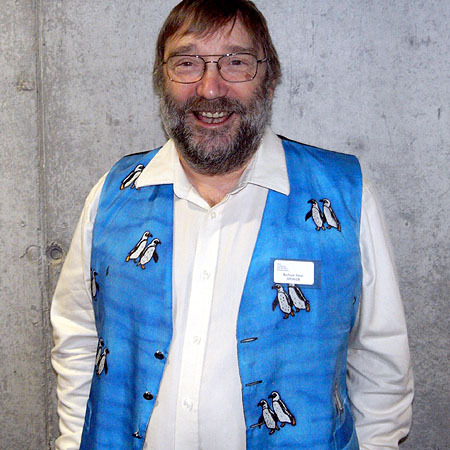 In case you wondered: Peter always wears penguins! Peter Barham (physicist, author of The science of cooking) started the day by giving an introduction to the scientific approach to cooking. Cooking started a lot of science, and chemistry (and alchemy) has origins that can be traced back to the observation of how food changed when cooked. And as a side note: even the word chemistry is linked to food through the greek word Khymos 🙂 Until about 100 years ago there was a clear link between cooking and chemistry, but then came a period where scientists mostly did not bother much about food. Until Nicholas Kurti entered the scene: that’s the guy who said that “I think it is a sad reflection on our civilization that while we can and do measure the temperature in the atmosphere of Venus we do not know what goes on inside our soufflés”. Four examples were used to illustrate how science can help chefs. 1) Conflicting reasons are given for why salt should be added to blanching water to retain the green color of vegetables. Contrary to popular belief salt does not raise the boling temperature of the water with more than a fraction of a degree. Science tells us that there really isn’t any good reason for adding salt to the water when blanching vegetables. 2) Science also provides insight to what happens when we heat up meat. When heated the meat first gets tougher. At around 40-45 °C the meat proteins start to denature, and at 55 °C the meat goes from tender to tough. Prolonged heating above 55 °C however will cause the collagen to dissolve into soft gelatin. 3) Thanks to science we now have a vide range of gelling agents (or hydrocolloids if you like) available for use in the kitchen. They can be used to create gels that are hard, soft, tough, elastic, brittle, hot and so on. We can also explain the crunchy and crispy texture of caramel which technically is classified as a “glass”. And we can also understand why ice cream has such a soft texture. This has to do with the very small size of the solid particles in ice cream (they’re typically < 1/10 mm). And a very nice way of achieving this is by making the ice cream with liquid nitrogen so it freezes very fast. 4) Science helps us understand what flavor is and how we perceive flavor using all our senses. For instance our memory plays an important role when our brain interprets a flavor. Your history of eating will influence how your next meal tastes! Sight is also extremely important. This can easily be demonstrated with some white wine and blue/red food coloring. If an unsuspecting subject is asked to describe “white” white wine and white wine colored with blue and red food coloring the descriptions will probably be typical of a white and red wine. Even if you know your are drinking a red colored white wine it is hard to believe that it is the same wine. The color of plates also influences our perception of flavor, so most people find eating from a blue plate unpleasant. Sound influences how we chew and a crunchy sound actually stops our jaws from closing to fast. If the chewing sound is played back with a 0.5 second delay it is almost impossible to eat! It has also been shown that the beat of music influences how fast guests chew, and apparently there is a restaurant in Australia that utilizes this. It has also long been known that touching sand paper or smooth skin can affect the texture of what we eat. 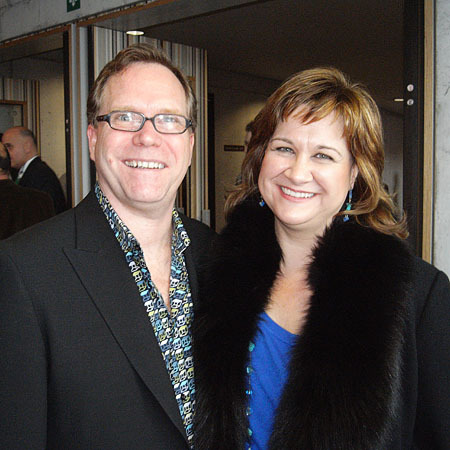 Next up were Karen Page and Andrew Dornenburg who presented several of their bestselling books on cooking and flavor, including Culinary Artistry, What to Drink With What you Eat and The Flavor Bible. They made an important point that cooking is the sum of ingredients and technique/preparation. 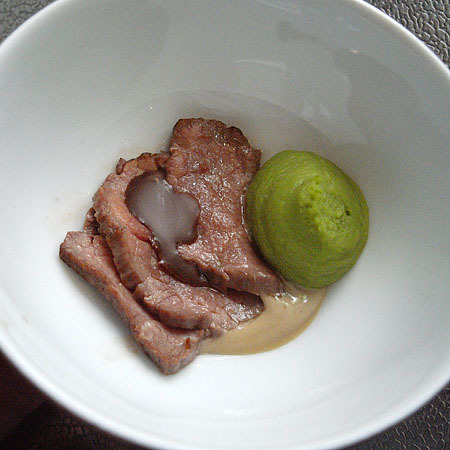 Food science and molecular gastronomy has provided a lot of information on technique, and the example par excellence is Harold McGee’s On food and cooking. However, for ingredients and flavor pairing in particular there hasn’t been any authoritative source available, forcing chefs to cross read a number of cookbooks when looking for new flavors and pairings. It was this realization that motivated them to write Culinary Artistry which is really a thesaurus of classic pairings. I can testify to it’s usefulness – and one example I’ve presented here on the blog are the cherry jams I made with pepper and other spices. Their most recent book, The Flavor Bible, is an updated and expanded edition of Culinary Artistry which includes and reflects the changes in consumer preference in the last decade. I have emailed a litte with Karen and Andrew previously and got the opportunity to chat with them in the break. – We’re excited to learn about new approaches to flavor pairing, Karen let me know. Andrew added that they hadn’t had the opportunity yet to sample molecularily based food pairings before so they we’re looking forward to try this. Lorenzo Cerretoni gave a presentation about flavor compounds in olive oil and how they can be paired with Mantis shrimp. After this informative, yet slightly less inspiring talk the Belgian chef Bart de Pooter presented his 4 taste model and how he uses this as a creative approach to create dishes and menus. One concept he promoted was to use ingredients from the same environment. A pheasant for instance walks on grass and eats maize and carrot, so naturally it could also be served together with flavors such as grass, maize and carrot. He also talked about physical and psychic needs and gave a slightly wrong explanation of the flavor pairing hypothesis. In fact during the whole day there was no proper scientific explanation and discussion of the hypothesis, but Bernard Lahousse – project leader of The Flemish Primitives – did give a popularized version of the hypothesis and an account of how it all started. He explained how the Firmenich scientist Franí§ois Benzi first stubled across a new way of pairing foods. At one of the Erice meetings he smelled jasmin in a garden and being a flavor scientist knew that this smell was mainly due to indole. Knowing that pork liver also smells of indole he got the idea that jasmine and pork liver might taste nice together – and they did! Bernard did show a picture of a GC-MS and explained how the University of Leuven has been doing food analyses and that only odors with concentrations above the odor thresholds were taken into account. Since he didn’t mention odor activity values (OAV) specifically I asked Bernard about that later and he confirmed that all the data in the food pairing website are now based on odor activity values. Since the first version of the food pairing web site was based on concentration and number of odorants I would expect that this would change some of the pairing charts and Bernard confirmed that this had been the case. For the event 10 chefs where each given a food product from one of the sponsors. These products were then analyzed and a list of suggested pairings was provided to all the chefs. It should be mentioned that these were top class chefs, but I have to admit that watching chefs cook in real time actually became quite boring after a while, especially since some of the dishes needed seemingly endless steps of preparation. 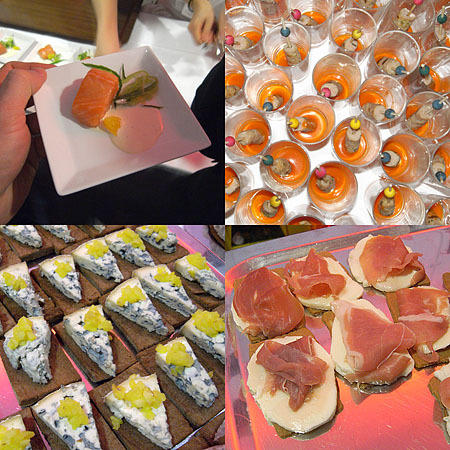 For most of the preparations presented it was also very unclear which of the ingredients used were picked based on the flavor pairing and which were picked by the chef to complete the dish. But the dishes looked absolutely wonderful! Too bad we couldn’t sample them 🙂 I found two of the dishes particularily interesting (and I think the recipes will be made available on the web). Sang Hoon Degeimbre, chef at L’Air du temps had chosen Leffe beer, but instead of doing a flavor pairing he did a flavor substitution. 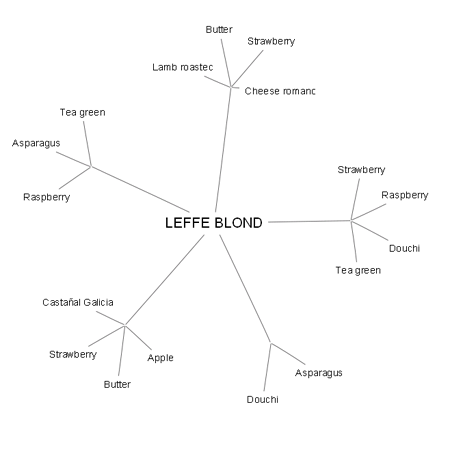 To achieve this he used several ingredients (shown in the figure below) which when combined would resemble Leffe. In fact he made a dish completely without Leffe that was intented to taste like Leffe – it’s hard to say whether he succeeded or not, but the concept is very interesting! And what warmed the heart of an organic chemist was that Sang Hoon had equipped his kitchen with an erlenmeyer flask and used a glass syringe (looked like a luer lock Hamilton type syringe to me). Figure from food pairing website. (C) Creax 2008. The food pairing I found most interesting was the one with Oud Brugge (a cheese), coffee and vanilla. To bind these flavors together chef Gert de Mangeleer from Hertog Jan used potatoes. The surprising element of the dish was the coffee – he sprinkled his dish with freshly ground coffee. The vanilla was applied as a grape seed oil extract of natural vanilla – a nice example of how oil can be used for flavor extraction. Ben sitting on the stage watching his own video. – If Einstein had been a chef, he’d probably be like Ben Roche, said presenter Gene Bervoets. Ben is the pastry chef at Homaro Cantu’s Moto restaurant in Chicago – it’s the restaurant where you can chose between a 10 and 20 course menu and then start your meal by eating the menu. Ben’s topic was the Chicago style hot dog and he started off by presenting a mind map of this, resembling the food pairing charts at the food pairing website. Most of his presentation was in fact prerecorded video clips which were really entertaining! His deconstruction/construction of the Chicago style hot dog resulted in a chips & salsa. Evolution of flavor turned the hot dog into pop corn (“less calories than when eating the hot dog”) sprayed with hot dog infused oil and sprinkled with freeze dried garnish. Translation of culture resulted in a Mexican version of “encased meat” using chorizo and a soft taco shell. This dish was also made into a dessert version. Lastly the hot dog was transmogrified into a cartoon dessert version with strawberry sorbet, mint and pistacchios. Hopefully the videos will be made available, but in the mean time you can check out the video of Ben at Taste3. Of these my favorites were the almond thins with mozzarella, fig and ham, and the cooked beef with peanut, chocolate vinagrette and peas. The potato cream was nice, but was a litle overpowered by to much cheese. The program session was closed by Albert Adria, younger brother of Ferran Adria. He showed stunning pictures from his coming book natura, accompanied by videos showing how the different elements of the dishes are created. 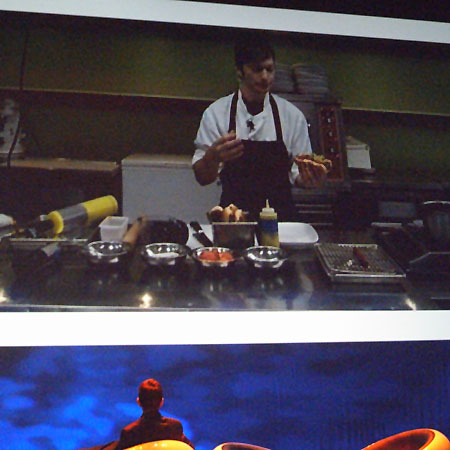 He also showed a short teaser documentary for A day at el Bulli. Next year’s meeting will be devoted to tools, including one which was presented at the very end of the day with music, ballet dancers and fire works: a reinvention of Ford’s assembly line for mass production of haute cuisine. Now I find the first part, about not needing to add salt to keep vegetables green almost mind blowing. Even Thomas Keller goes on about how necessary it is to have the water “as salty as the ocean,” when blanching vegetables. If this really has no effect, then is the only purpose of blanching to “precook” vegetables to speed the cooking up time later, when it’s mealtime? I had a blast at the flemish Primitives… what a mindblowing day. This is really a follow up from the sous vide posting, but I wanted to let people know. I cobbled together an immersion circulator using an Auber Instruments regulator and a non-digital rice cooker, which worked fine. I’ve just added an aquarium circulating pump — the model is an AquaClear 50, which cost me about $40. I played with the setting a bit, and found it worked best without the little air tube. So I can now confidently say the temperature is set, and the water now circulates. I also returned the Food Saver vertical model, and replaced it with an older Food Saver model, without the feeding motor that doesn’t work. Sorry to hijack the thread. 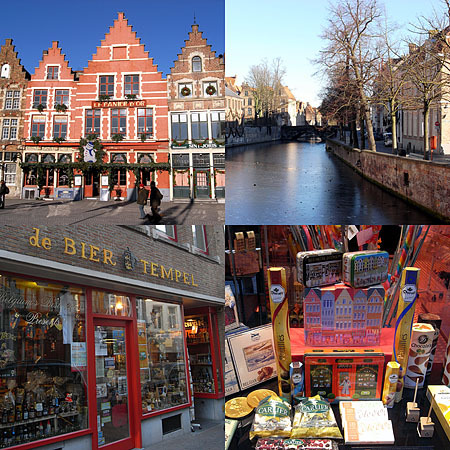 Hi, I was in Bruges too, terrif event! I took some video, including the “chicago style hot dog” of Ben Roche, chips&salsa version. Not very high quality, anyway…. I’ll publish them in a few days, I hope. Cool – I just found the videos at your site. ubergrub: As far as I know the key odorants of soursop have not been studied so I’m not able to comment on the pairing with fennel. Fennel however has been included on the http://www.foodpairing.be website. Remember that the flavor pairings based on key odorants are really a niche when we talk about flavor pairing in general. Most of the foods we combine do not share the majority of their key odorants, but they still go very well together! You describe how soursop masks certain flavor aspects of fennel. This is interesting! Maybe other readers have similar experiences?